After a very, very short time here, I've found the Wordpress platform to be not only more elegant but also easier to manage - apologies for the confusion. Hereafter all new posts will be made at http://mingthein.wordpress.com - please update your bookmarks accordingly. ..."what gear do you use?" is the most common question I get from aspiring photographers or keen amateurs. Primary - Leica M (I'm Leica sponsored); M9-P chrome, 35/1.4 Summilux-M ASPH FLE, 50/0.95 Noctilux-M ASPH, 90/4 Macro-Elmarit-M (on it's way, I'm told). Zeiss ZM 2.8/28 Biogon, ZM 2/50 Planar. I've also got a Visoflex III and Bellows II for macro work, and a home-made hotshoe mount PC sync cable that fits under the Visoflex housing to trigger my flashes. Primary, special purpose - Nikon FX; D700+MBD10, D800E (on it's way), AFS 24/1.4 G, AFS 60/2.8 G Micro, AFS 85/1.4 G, AFS 28-300/3.5-5.6 VR G. Zeiss ZF.2 2/28 'Hollywood' Distagon. 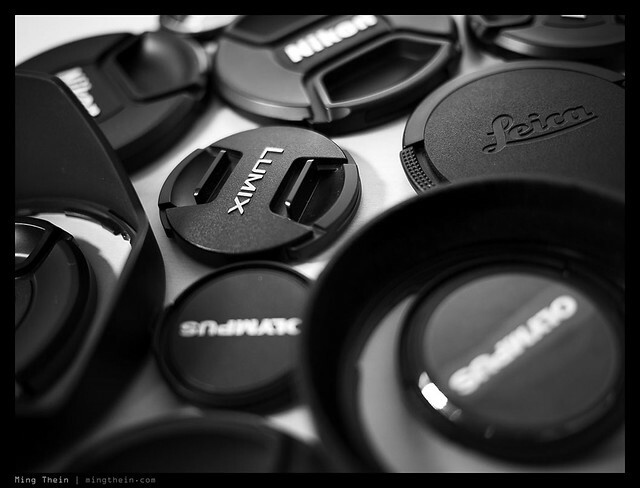 A whole bunch of extension tubes and adaptors. Three SB900s and one SB700. Compact - M4/3; Olympus Pen Mini E-PM1, ZD 12/2, ZD 45/1.8, ZD 14-42/3.5-5.6 IIR. 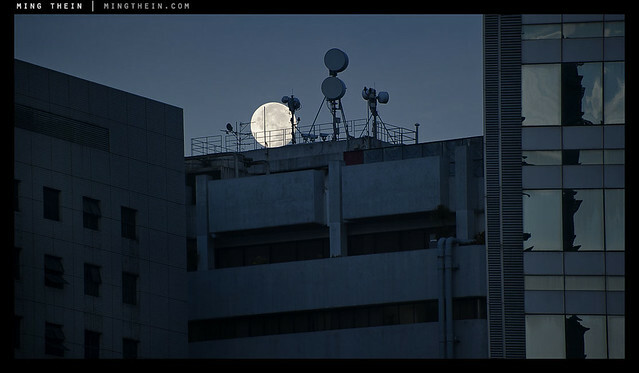 Panasonic Lumix G 20/1.7. Contemplating the upcoming ZD 75/1.8 and ZD 60/2.8 macro. Point and shoot - Leica D-Lux 5 (incoming), Ricoh GR Digital III and of course the iPhone 4. ..."how do I get better?" comes from people serious about learning. As I said before: practice, practice, practice. Also, look at other people's work; famous work; what don't you like, what do you like? Can you figure out how they did it? Can you figure out why the shot works, or doesn't? Critical analysis of an image often yields insights into composition that will help you instinctively arrange your frame when you look through the finder. And the two most important tips are a) watch the edges of your frame and b) make sure your subject is clear: if you don't know what it is, then it's almost certain nobody else will, either. And that makes for a very weak photograph. ..."how much do you (or should I) charge?" comes from people who want to turn pro. How much do you think your work is worth? What is your opportunity cost? If you're asking how much I charge, if we were in head to head competition, could you justify what you're asking? ..."what's your workflow like?" comes from professionals. RAW > ACR > Photoshop - nothing else gives me enough control over individual files, and even batches of files. I don't like libraries; I don't like batch editing; and I don't believe in using JPEG unless you don't have a choice, or your image is baked and done (and it's appropriate for the final intended use). ..."what's your day job?" is what I inevitably get from old hands who've seen the game change from film to digital to social media and wonder how on earth there can be so much content out there - some truly great and probably only made accessible by the digital era; yet so little appreciation for art. Kuala Lumpur, Malaysia. 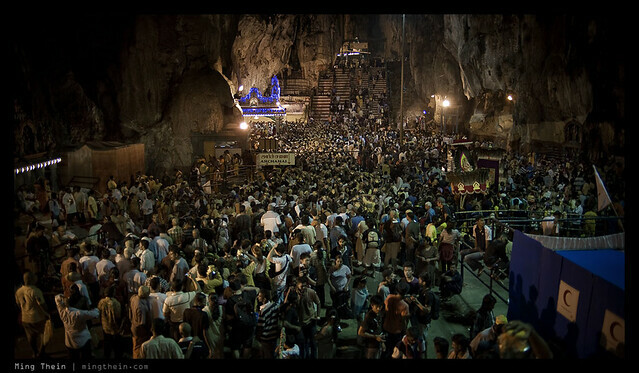 The limestone Batu caves are alive with primal energy through the night as millions of Hindu devotees bring offerings to the temple of Lord Murugan after a 25km trek from the companion temple in downtown Kuala Lumpur. 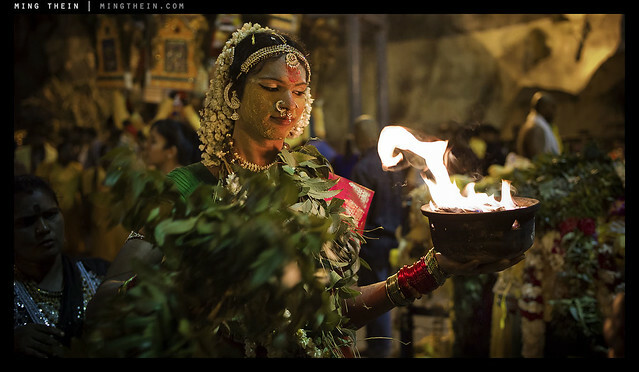 This person - it's not clear if it's a man or woman - was very much in a trance, holding the bowl of fire and dancing in a haunting way. Her/his eyes were closed almost all of the time, but knowing when to pause to let an assistant or friend pour more oil into the bowl to keep the fire going. 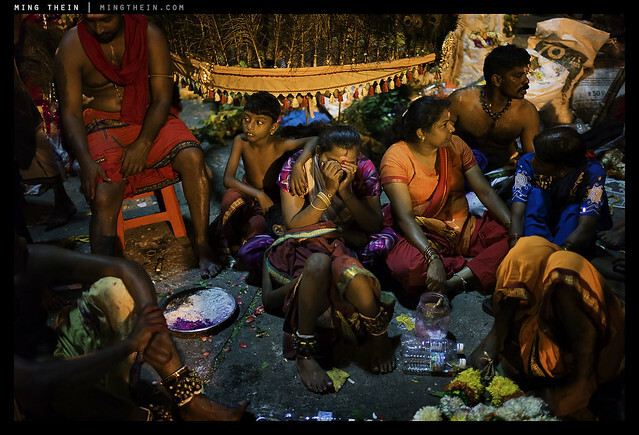 Leaves were waved through the fire, ostensibly for purification or offering. Lit mostly by the fire and the dim lights inside the cave, by her/himself she would have been a spectacle. Yet this was just one of dozens, or even possibly hundreds, of similar scenes going on at the same time. One can't help but admire millions' dedication to their faith - and yet at the same time wonder where the divergence lies, because if all religions fundamentally preach the same thing, why do people still lie, cheat, steal and kill? Why is there less and less honor and honesty in this world? I can't answer that. Towards the end of shooting the sequence, one of her/his assistants advised me not to take so many photos; I probably wouldn't sleep well that night. Things visit people, he said. I thanked him and left; I'd finished anyway. Most nights I don't sleep that well, unless I'm absolutely exhausted. Strangely enough, I slept like a deep, satisfying dreamless sleep that night - for a solid eight hours, a lot more than the two or three I normally manage. What makes people act the way they do? What determines the nature of self? These are the two questions that come to mind after watching a devotee get released from their trance by what is presumably a priest of some sort (bald, at left) though I have also seen the procedure performed by another devotee. The releaser grips the head of the devotee and blows on his forehead; a grimace of pain and he collapses, supported by his friends or family. 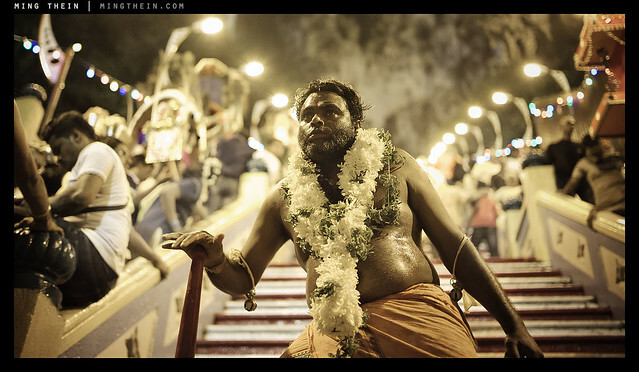 It can't be physical pain, becuase he carried a heavy portable shrine 20+km on foot from the main temple in downtown Kuala Lumpur, with offerings of lime and milk pots attached to his flesh via hooks; it looks to be spiritual pain as something is separated inside and his own self is restored. Where does the self go? Why is there pain when it returns, not a sense of happiness or at least familiarity? 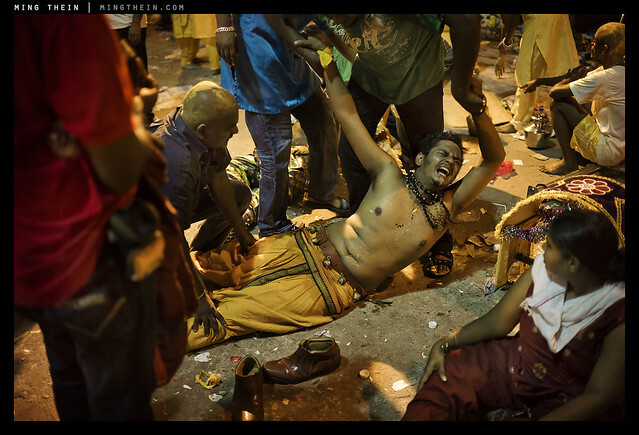 Instead we see devotees slumped exhausted (understandable) and looking confused, lost and vulnerable. We are but a small, unimportant and impotent part of this world. And timing and luck are pretty much our only ways of being in 'control' - for instance, if I wasn't exactly where I was with exactly the right camera settings and focus set, I wouldn't have gotten the shot. Could I have controlled the elements, replicated the emotion of the subject? No. Let's revisit this exercise from a photographic point of view. The full set is available here on flickr. All content and images © Ming Thein 2012 onwards. Awesome Inc. theme. Powered by Blogger.